(Editor's note: The following account is based primarily upon my recollections of events that occurred some 21 years ago. It also includes recollections of things that I was told by other people that were involved - - what lawyers call blatant hearsay. ﻿I have also tried to reconcile various conflicting written accounts of what occurred.﻿ Thus, while I have endeavored to be accurate, these caveats should be borne in mind). 'Twas in the summer of '92, August 7 to be exact, the Queen Elizabeth 2 ran aground off of Martha's Vineyard and her passengers evacuated. It was an incident that attracted worldwide media attention. Although no one was injured, the world was shocked. QE2 was the world's most famous ship, the epitome of luxury and nautical excellence. Things like this did not happen to the QE2. According to the Cunard Line brochure, QE2 was supposed to do a five day cruise to Bermuda from New York City between August 3 and August 8, 1992. 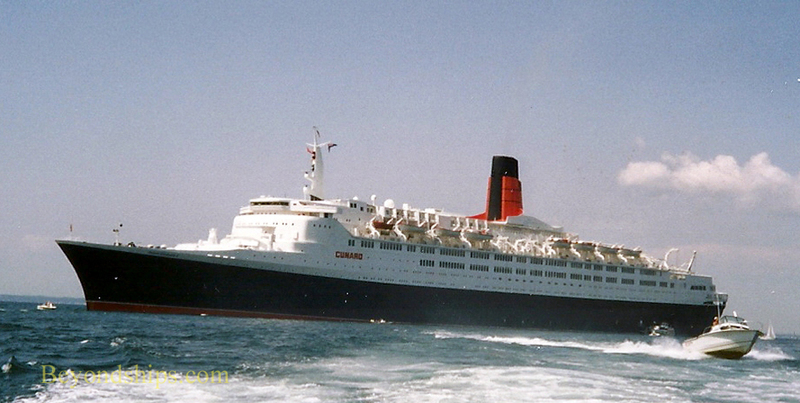 However, something had gone wrong and Cunard had not gotten permission for QE2 to berth (or more accurately in those days, anchor) in Bermuda. Consequently, a five day Canada and New England cruise was substituted instead. This would be an unusual Canada cruise for QE2. The ship usually did one or two of these cruises each year but they were almost always in September or October in order to coincide with the changing colors of the fall foliage. This one was going to be in early August. But since New York is quite hot at that time of year, the cruise would be attractive as an escape to cooler climes. The itinerary was unusual as well. 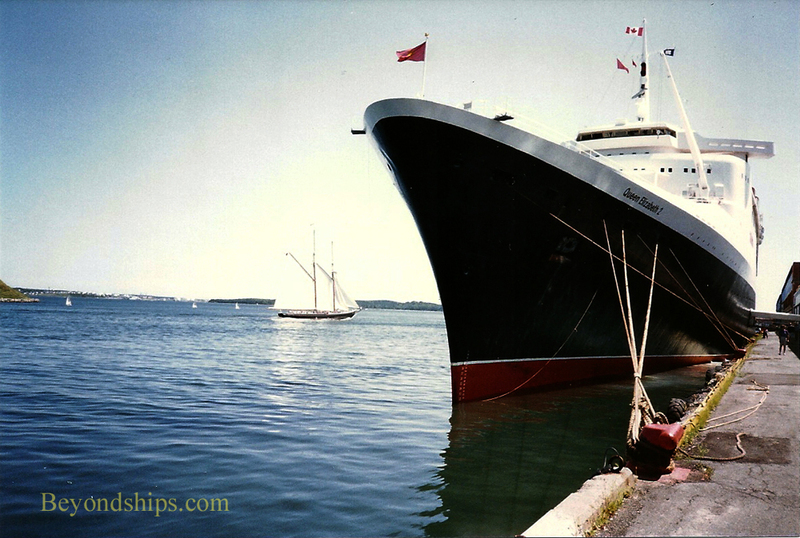 Typically, on a Canada cruise QE2 would call at: Halifax, Nova Scotia; St. John, New Brunswick and Bar Harbor, Maine. Sometimes Bar Harbor would be replaced with Boston, Portland, Maine or Newport, Rhode Island. This one was going to Halifax, St. John, New Brunswick (not St. John's, Newfoundland as incorrectly asserted in some QE2 histories) and Martha's Vineyard, an island off the coast of Massachusetts. The addition of this unusual port was one of the things that attracted me to this cruise. I had sailed on QE2 some 17 times before and one of the things I liked about the ship was that each voyage was different. 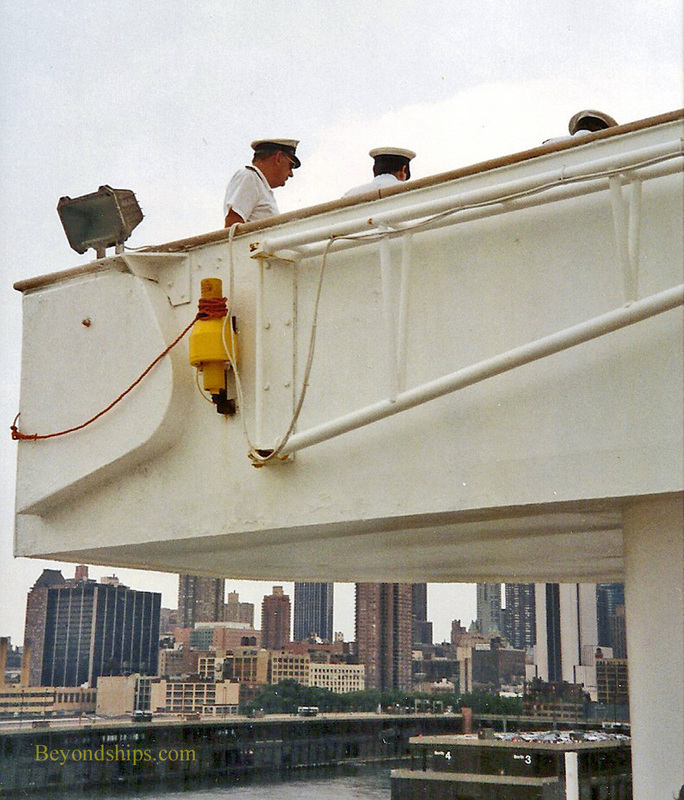 To illustrate, I had just been on QE2 for her Fourth of July/Columbus Quincentenary Cruise where we had anchored in New York harbor to watch an international parade of ships and then the Macy's fireworks display. I was also booked to do two crossings on her later in August and every crossing is different. Going to Canada and the resort island of Martha's Vineyard would be more variety. Despite being a late starter, the cruise sold well and 1,824 passengers embarked in New York on 3 August 1992. The warm overcast day in New York and was followed by a pleasant but uneventful day as we traveled up the coast towards Canada. It was foggy when the ship arrived in St. John. This was before St. John became a popular port of call for cruise ships and its cruise terminal was still a decade or so in the future. Therefore, QE2 docked at the container port on the opposite side of the river from the town's business district. Nonetheless, seemingly everyone in St John had come down to welcome us including the mayor and the city council in their elaborate ceremonial outfits. Above: Captain Robin Woodall and officers on the wing of the bridge leaving New York. 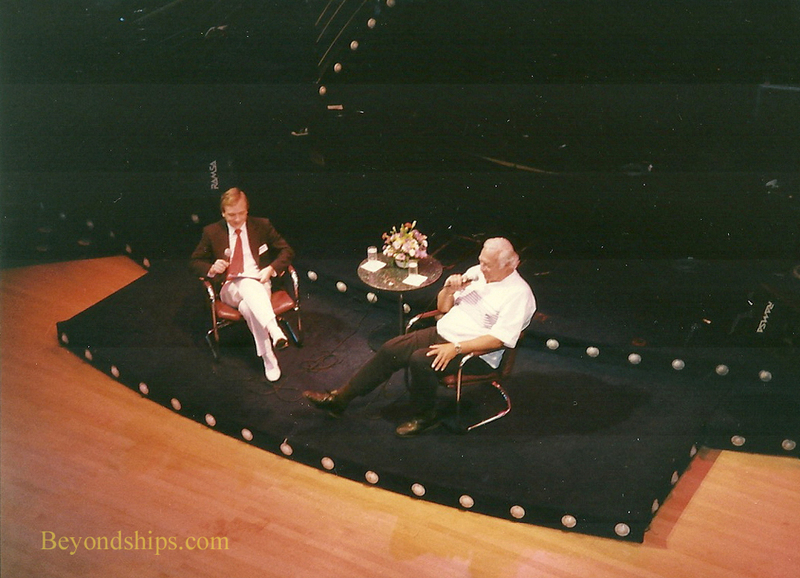 Below: Cruise Director Lindsay Frost interviewing actor George Kennedy in the Grand Lounge during the cruise's only sea day. Above: QE2 docked in Halifax, the second port of call. During the course of the day, the weather improved and by the time QE2 was ready to sail, crowds of people lined the river banks. The town's fire engines shot streams of water into the sky. Bands and bagpipes played. Captain Robin Woodall responded with a tour de force display of seamanship. The ship was docked along the side of the river facing upstream. After letting go QE2's stern, the powerful incoming tide swung the ship 180 degrees. To considerable cheering, QE2 proceeded out to sea. The next day in Halifax was a gorgeous day. In addition, because it was early-August, all of Halifax's attractions were open. That evening, QE2 hurried down the coast of Canada and New England. Her course would take her around Cape Cod and then into Rhode Island Sound. She would approach Martha's Vineyard from the west. It was a long run but QE2 was a very fast ship.